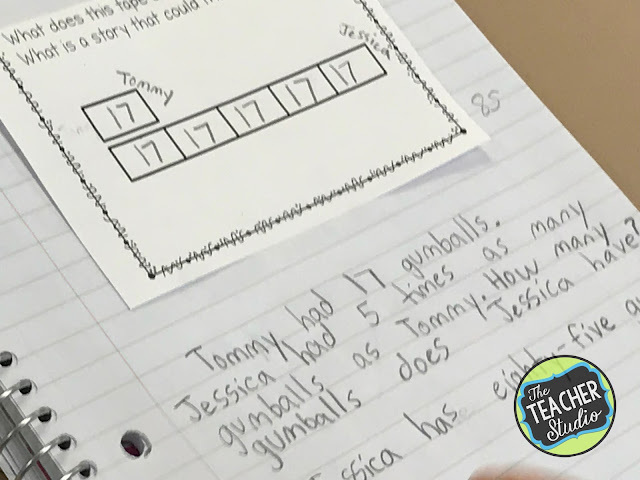 Word problems are a key part of rigorous standards everywhere, but teachers and students alike often dread tackling them. Even textbooks sometimes save them for the bottom few problems on a page or a separate lesson toward the end of a chapter. 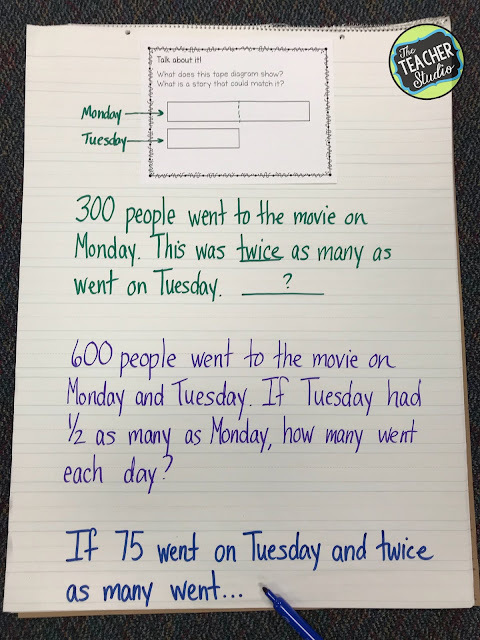 The thing is--word problems (at least good ones!) are the "real world" part of math. 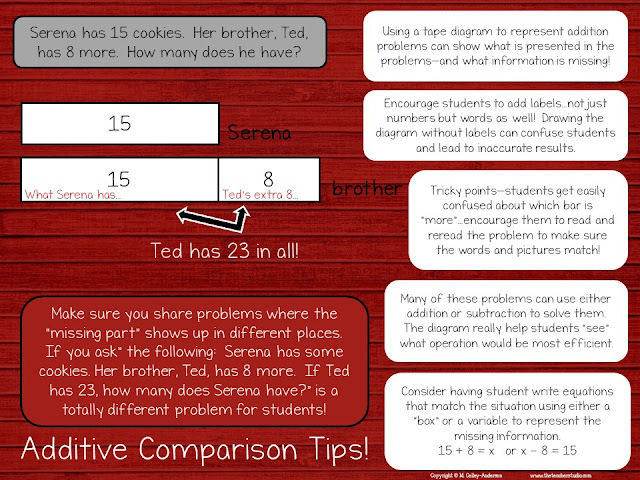 One type of word problems, comparison problems, can be particularly challenging for students. Let's look at some teaching tips that might make them more accessible! As teachers, we should always be striving to help our students understand that the skills we are teaching are them are FOREVER...not just to complete a math page or worksheet. 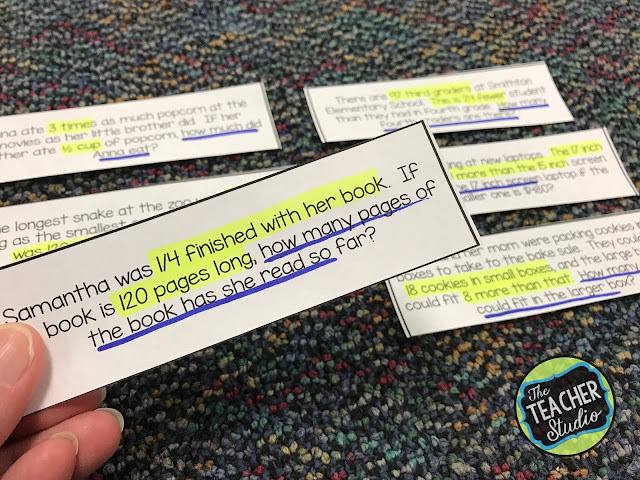 One skill that we really want to make sure our students understand is the need to critically read math problems to figure out what is being asked, what information is given, and to make a plan for solving. So often we do the thinking for our students. Just look at how many of our math books are organized. A lesson entitled "Solving Addition Stories" doesn't leave much room for student thinking, does it? Providing students with a constantly spiraling variety of problems forces them to think for themselves, learn to look for key information in problems, and make solution decisions accordingly. "Larry has 14 baseball cards. This is 25 fewer than his sister Becca has. How many cards does Becca have?" By teaching "fewer" as a signal to subtract, a student will certainly not think through this problem correctly! One strategy that can really help students make sense of problems is to be able to visualize and draw models of different problem types. 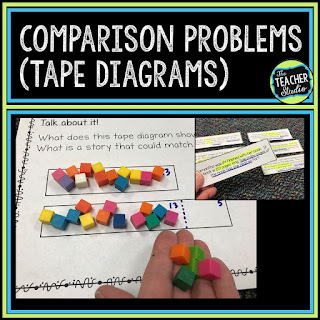 Comparison problems--sometimes represented with "tape" or "strip" diagrams are a GREAT way to help students visualize the math! I thought I'd share a few ways that these can be super helpful for students--whether used as whole class lessons or for intervention groups. "Bill has 13 candies. If Sarah has 5 more than Bill, how many candies will Sarah have?" Now...this is a VERY simple example and is perfect to use with intermediate students who really need to back up and see the actual manipulation of the numbers. As students get more adept at these problems, you might see that a sketch with only numbers placed in the diagram is appropriate. 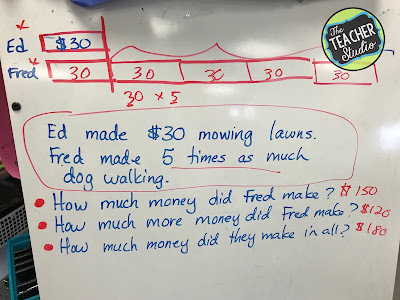 Check out this lesson where we "filled" a diagram and then brainstormed a ton of different questions that could work with this problem. Again, part of making sense of problems is realizing that the QUESTION matters...and we need to always be looking for what that question is! Another strategy to get students really visualizing is to take a blank diagram and create different stories to go along with them...help students get flexible with their thinking. 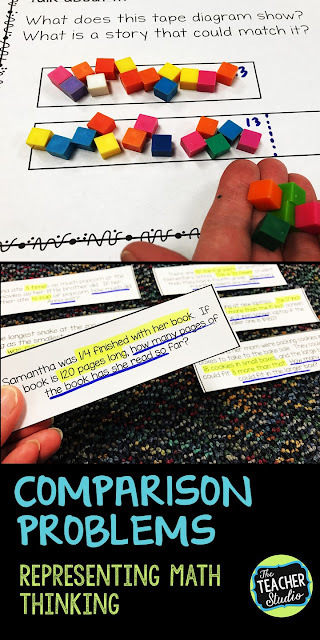 Once you have worked with the class on this--send them loose to try some on their own! 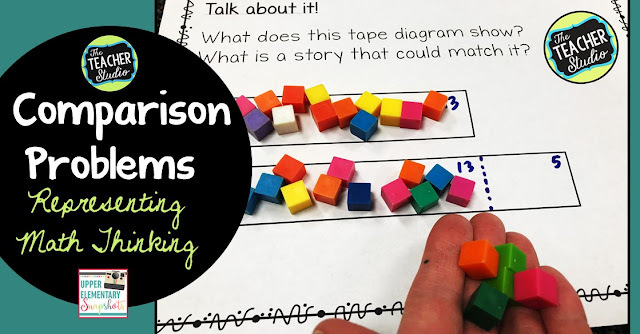 Share with partners or put some great examples under the document camera to look at all the different ways that students found to visualize this math situation. 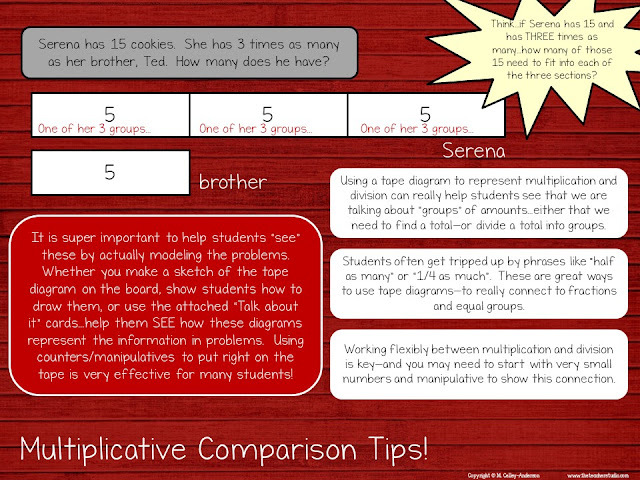 The beauty of comparison problems is that they actually get students thinking about all FOUR operations--and how addition and subtraction are related and how multiplication and division are related--and even how those inverse operations can be used in solving. Although we may call some problems "additive" comparison, the reality is that the information can often be represented by subtraction as well. 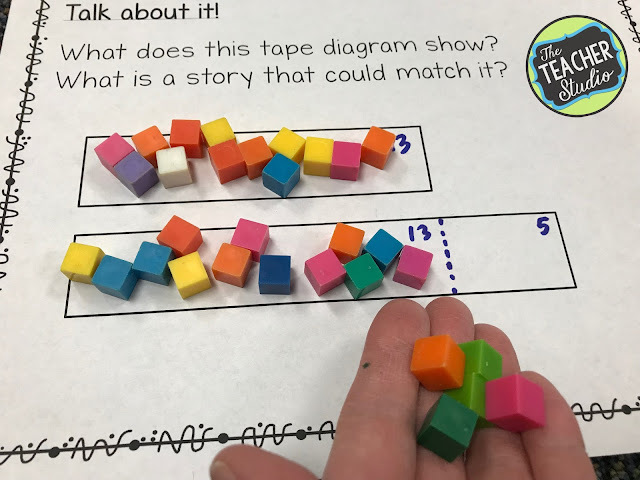 These problems really form the foundation for later work in algebra, so it's so important that we help students recognize what is happening in these problems--and to find different ways to model them. As students develop their math skills, we know they need to be able to deal with "groups of" and division problems as well. This also ties directly to fraction work ("1/3 of ..." as opposed to "3 groups of..."). Helping students SEE the difference between 3 groups of five and 3 MORE than five is such a valuable exercise. Interested in trying the activities pictured above? Here you go!